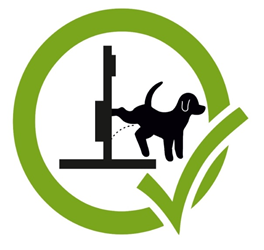 The development, research and testing ECO DOG TOILET started since 2001. In its development from the very beginning cooperated with the University of Veterinary Medicine in Košice. Research and testing was carried out under the supervision of prof. DVM. Peter Juris, PhD., And DVM. Lucie Sabová, PhD. The result is a hygienic facility and certified by a patent. Positively to the ECO DOG TOILET reflect the vets, staff government, State Veterinary and Food Administration and the Regional Public Health Authority in Košice. ECO DOG TOILET station has been logged in the competition for the cleanliness of public spaces, where she won first place among more than 30 submissions. At present, our main objective to expand ECO DOG TOILET in all locations, thus contributing to a cleaner and more beautiful world! Services including the operation of ECO DOG TOILET stations will be carried out by our company ECO TOILET DOG GROUP Ltd. The activity of our company builds on many years of experience of one of its members, who include research, development and carrying out the construction of the equipment dedicated for over 15 years. Use ECO TOILET DOG STATION helping to clean your city and maintain a healthy environment for all of us.